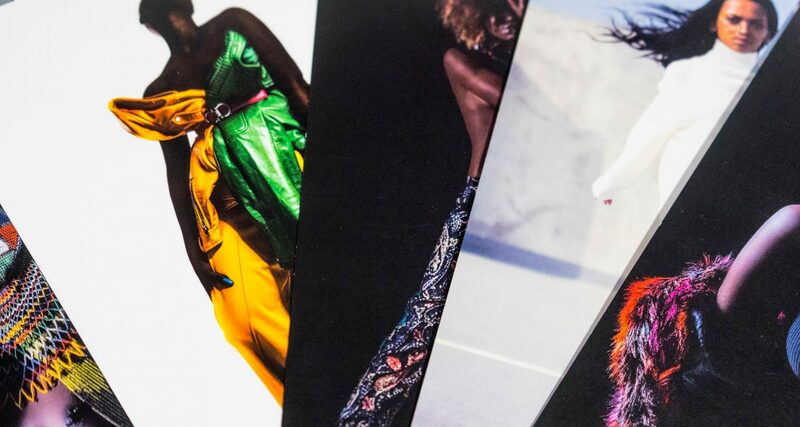 Our BA (Hons) Fashion Branding and Communication course will help you to become a part of this rapidly growing and exciting aspect of the fashion industry. On this course, you’ll gain practical skills and explore the thinking behind fashion branding and communication. You’ll create image and film, and develop visual identities using the latest creative software. We’ll also teach you the theory behind everything from creating a narrative for an image to building a global brand identity. Great fashion communication comes about through collaboration. In AUB’s creative community, you’ll have the chance to do just that. You’ll be introduced to, and work with, students on other BA(Hons) courses, including Fashion, Commercial Photography, Textiles, Film Production and Make-up for Media and Performance, so the opportunities are limitless to apply your skills and collaborate. According to the British Fashion Council, the UK Fashion Industry supports 797,000 jobs. With a degree from AUB, you will also make your own unique mark in this exciting space. We’ve recently been awarded Gold by the TEF (Teaching Excellence Framework). Our teaching staff are exceptional. They are inspiring teachers, industry practitioners, technicians and researchers who are all here to support you with your studies and help you to achieve outstanding outcomes. Through the journey of the course, you’ll experience challenges and new possibilities whilst seeking innovative solutions to concept origination, application and final outcomes. On this course, you’ll develop key skillsets which will underpin and inform your professional growth and develop your sense of place in the industry. You’ll critically reflect on the study of fashion branding and communication from the beginning of the course, with historical design studies and academic theory are embedded across the two terms. These two units define through investigation and experience the range of possible practices and areas of study you may want to engage with as a fashion communicator during your time on the course. At the end of your first year, you’ll create an individual project concept which may involve aspects of collaboration, where you’ll begin to define strengths and specialist choices through the production of a publication or digital equivalent that embeds the core skills learned in the first two terms. The Level 4 journey will not only shape your experience through learning new skills and knowledge, but will identify your strengths, interests and areas of specialisms as well as introducing you to professional practices. It will also ensure that you engage with a broad range of experiences, which will support specialist decisions in the future. During your second year, you’ll be able to undertake a UK or international work experience placement or take part in an AUB in-house ‘Live Project’ with a current brand or design company. Both options will help prepare you for the professional world by giving you firsthand experience of commercial businesses and the expectations around professional industry practice. You’ll also undertake a trip to a major fashion capital that will broaden your professional experiences and networking skills. You’ll develop a critical understanding of consumer awareness and market diversity, whilst directly informing focused communication development and market analysis. You’ll engage with distinct and challenging research methods and visual communication, while at the same time preparing for a professional role in industry. You’ll be encouraged to question existing practices and look for new solutions, exploring diversity, niche market opportunity and develop empathic consideration for the local and global fashion industry. You’ll develop a portfolio of visual and written material to promote yourself in your continued professional development. You’ll produce a written document, in the form of an article or editorial piece or whole publication, with supporting collaborative images which embed your design philosophy and narrative. In your final year, you’ll undertake Final Major Project units relevant to your desired future career or postgraduate study. Your Project will be appropriate for Graduate Fashion Week, relevant exhibitions and related fashion events. Where possible, you’ll have the opportunity to be involved with exhibitions or events in the Bournemouth locality, Graduate Fashion Week or produce a publishable branding and communication outcome. In the first term, you’ll also produce either a dissertation, or a focused business proposal, in which you demonstrate an advanced range of research and writing skills. You’ll also undertake a Personal Branding unit, preparing you further for your career by developing a professional portfolio of your best work, along with supported learning around CV, role application, personal presentation, interview techniques and further engagement with the industry. Ultimately the final year requires you to define the final direction of your theory and practice. It encourages you to be focused and innovative. You will graduate with the knowledge, understanding, professional skills and creative agility necessary to further develop your specialist practices, in professional environments. We actively encourage you to form collectives, start-up businesses, organise events, complete internships, enter competitions and work collaboratively.